Chinese President Xi Jinping has expressed willingness to work together with Prime minister Imran Khan to strengthen Pakistan-China all-weather strategic partnership and build a new era of shared destiny. He made the remarks during a meeting with Prime Minister Imran Khan at the Great Hall of the People in Beijing today. Xi Jinping said China attaches great importance to its relations, with Pakistan reaffirming they were “all-weather” friends. He reiterated China's steadfast support to Pakistan on all issues of core interest. In his remarks, Prime Minister Imran Khan emphasized President Xi's vision of Belt and Road initiative and its flagship project CPEC would translate into a win-win situation for shared prosperity in the entire region and beyond. Imran Khan said friendship with China is the cornerstone of Pakistan's foreign policy and expressed the desire to further consolidate this relationship. Prime Minister Imran Khan said Pakistan stands by China in safeguarding mutual interests, shared ideals and promoting multilateralism. He extended an invitation to President Xi Jinping to visit Pakistan which he accepted. Both the leaders reviewed the entire gamut of bilateral relations and held in-depth discussions on regional and global matters of mutual interest. The two leaders agreed to work closely to overcoming growing political and economic uncertainities. Prime Minister Imran Khan amd President Xi also reviewed progress of CPEC, expressed satisfaction on its achievements and undertook for its early completion to maximize the benefits for Pakistan. 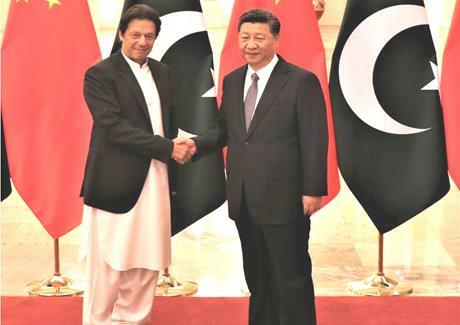 The Chinese President congratulated Prime Minister Imran Khan on his election and assumption of office. Prime Minister Imran Khan thanked the Chinese President, government and the people of China for their warm sentiments and hospitality. He congratulated them on the 40th anniversary of 'Reform and Opening-up' which has resulted in China's meteoric rise.